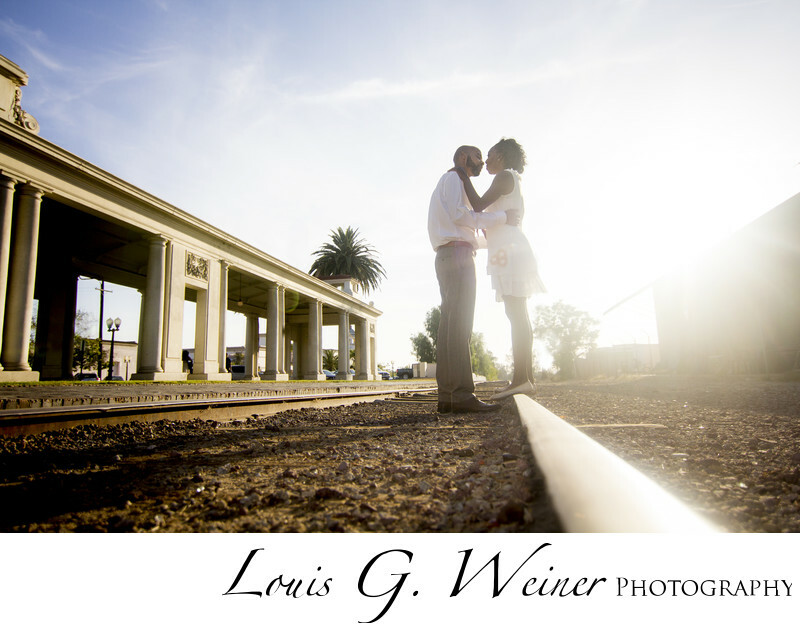 Redlands Train Station, a favorite of local photographers and couples a like for just about any portrait. This young African American couple had a great time at this local Redlands spot. The station and tracks have not been used in years, although there is talk of the Metro Rail coming in the future. The station has a great historic look about it, old wood and lots of arches. It is fun to use the tracks for photographs knowing the subject is safe. Engagement Sessions are so magical, it is wonderful see a couple express their love for each other. I am grateful when I am asked to share in these special moments. I love to step back and let couples share how they are together, by finding beautifully Photographic settings with wonderful backgrounds and observing with the camera I can show the couple being natural together journalistically. If my couple would like or needs more direction I am happy to help them. The goal of every session to capture beautiful moments of our couples sharing special time together. Images that will be special for generations to come. Location: Redlands Train Station, 347 Orange St. Redlands, California 92374.